Autojoin lets SysReset manage the channels and servers that you want to join automatically. I actually don't use this myself, but its graphical interface seems easier for some people to use. To autojoin a channel or server, select Autojoin Manager. With the menu open, add the servers that you want to autoconnect to after you have connected the the one selected in the options (if you use the autoconnect option in mIRC). Add that to the "Server Autojoins" section. To select the channels to autojoin to, add the server of the channel you want to join at the top, then single click it. Add a channel from the Channels section to autojoin. If you also use Nickserv Manager, (explained below) then you might want it to have it wait till you are identified (This makes it so you are identified when you join a channel and you will be opped/hopped/voiced). "Maintain Joins" supposedly tries to keep you in a channel.. but it doesn't seem to make a difference after I have set up my mIRC options. 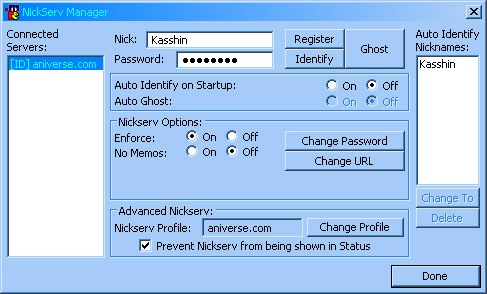 Open up your NickServer Manager menu. Put in the nick you use inside "Nick:". If you already registered your nick, put your password inside "Password:" and click "Identify". Your nick will automatically be added to "Auto Identify Nicknames:", so every time you change / change back to this nick SysReset will automatically identify your nick. You might want to check "Auto Identify on Startup", this will automatically identify your nick when you start SysReset up. You can also change other Nickserv Options inside in the middle frame. To add more nicks, just put the nick and password in again and click Register if you are registering it, and Identify if you already registered.